I am doing the disease West Nile Virus. Most people who are infected do not show symptoms. Only 20% of people develop symptoms such as fever, headache, body aches, fatigue, back pain, skin rash, swollen lymph glands, and eye pain. Less than 1% of people develop worse symptoms such as fever, severe headache, stiff neck, disorientation or confusion, stupor of coma, tremors or muscle jerking, lack of coordination, pain or sudden muscle weakness. 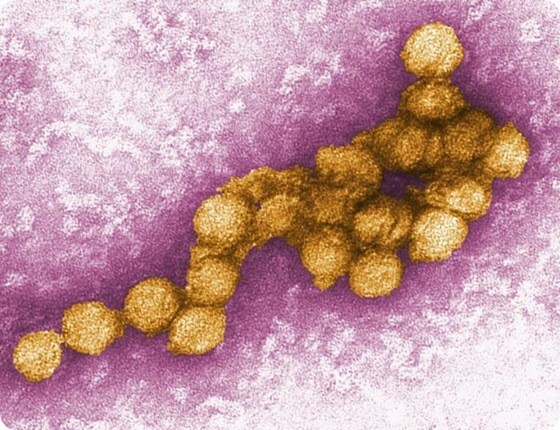 West Nile Virus travels in mammals and insects. Birds and mosquitoes are the most common form of transportation. Birds tend to travel long distance for migration, they infect the people when they die in the area. Mosquitoes will sting you and infect you in the proccess. This disease has been in Africa for thousands of years. In the 1940s, it was rare for humans to catch it. 1937, Uganda, The first case appeared outside of Africa's borders. 1950, Israel, 500 Clinical Cases. 1974, South Africa, Thousands of clinical cases. 1996, Romania, 762 Cases, 17 Deaths, Virus Mutates. 199, Russia, 480 Cases, 40 Deaths. 1999-2002, United States, Over 3500, almost 200 deaths. It was in a total of 38 states. Avoid mosquito bites and dead birds. Mosquitoes are the most effective way to stop the spread of West Nile Virus.